GRAFENWOEHR, Germany — Wildlife is fun to watch in its natural habitat, but the fun quickly disappears when wild animals decide to share your home with you. Potential home visitors – or in some cases, invaders – like wasps, hornets, bats and birds are protected by law in Germany and require the help of experts to remove them from your home. Who do you contact in case of an unwanted guest? The Environmental Division is here to help. If you live in on-post housing or government leased housing, Environmental Division staff can come to your home and help remove the unwanted visitor. If additional expertise is needed, they will contact the appropriate county expert on your behalf. If you live in a private rental, staff can connect you with a county expert. Wasps and hornets tend to be territorial roommates, because they invest a lot of time building their nests. They are very protective of their homes. But hold your horses before removing that nest. Wasps and hornets are protected by Germany’s Nature Protection Law, and it is illegal to kill them without reason. Due to fear of that nasty sting, you might not realize the benefits of wasps and hornets. These fierce predators feed their young insects, helping with pest control as many species prefer crop-eating and garden-damaging weevils and caterpillars. And to improve their reputation, they pollinate flowering plants. You can help prevent nest construction around your home by checking the exterior for holes and cracks and patching any openings you find. Ensure that windows, doors and garage doors are properly sealed. Once a nest has been built, contact the Environmental Division, as an expert is needed to remove it. Bats are another animal species that might make a home visit through an open window or take up rental space in your attic. Many bat populations are declining due to loss of roosting and hibernation sites — hence why they might choose your home as a roost — and lack of insect food due to pesticides. Due to their decline, they are specially protected under both Germany’s Nature Protection Law and the European Union’s Flora Fauna Habitat Directive and for good reason, as they provide numerous benefits to the environment and humans. One benefit provided by all bat species here in Germany is that they are voracious insectivores, making them excellent pest exterminators. The common pipistrelle bat (Pipistrellus pipistrellus) can eat up to 3,000 midges in one night. If you find a bat in your home, call the Environmental Division immediately to help remove it. Please do not handle it, as bats can carry diseases. To prevent access into your home, carefully examine your home’s exterior for holes and seal any openings you find. If your bat guests are coming in through open windows, install window screens or rolladen. Adhesive window screens can be found at Self Help for those who lease government housing or in local hardware stores for private renters. Birds are not usually deemed a nuisance, but in some cases, conflicts arise when sharing space. 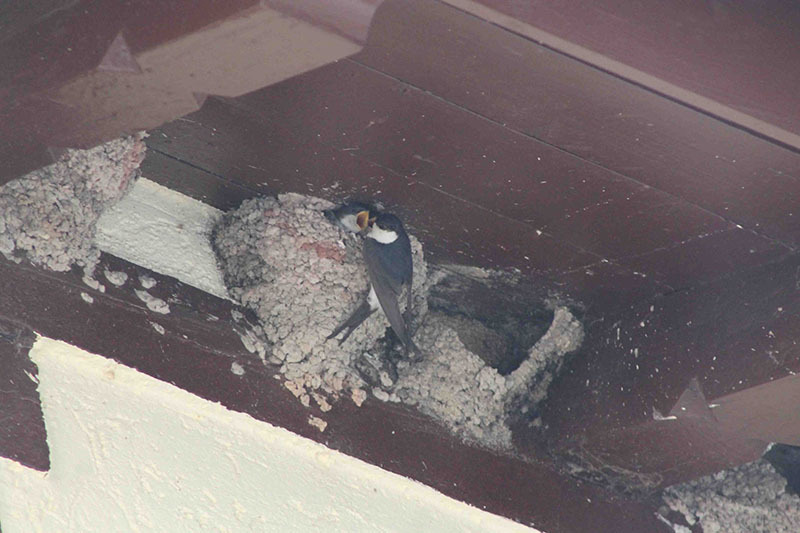 Swallows and house martins build unique nests with mud, plants and saliva under building overhangs and roofs. Depending on nest placement, droppings can create an unsightly mess. Since swallows, house martins and their respective nests are protected by both Germany’s Nature Protection Law and the European Union’s Natura 2000 Conservation of Wild Birds Directive, removing nests during any time of the year is illegal. Like wasps, hornets and bats, swallows and house martins dine on insects and help control pesky mosquitoes and midges. A solution to their untidy housekeeping habits is to install boards on your building to capture droppings. If you need boards installed, please contact the Environmental Division for advice. If unwanted guests in your yard is a concern, make sure to properly dispose of your trash by putting waste in its appropriate bin and not on the ground, closing trash bin lids and feeding your pets inside. Leaving pet food or an easily accessible trash buffet outside can attract potentially dangerous animals like foxes and wild boar. While hedgehogs are cute, please do not try to attract them to your yard with pet food. Feeding hedgehogs is detrimental to their survival because they become dependent on humans for food and will stop foraging on their own. This can lead to starvation and death. While they are not welcome guests in our homes, each of these species should be managed with respect. They provide significant benefits to humans, such as insect control and pollination, as well as significant environmental benefits, like being food sources for other animals and balancing our ecosystem. If you have issues with unwelcomed wildlife guests in or around your home, please contact the Environmental Division at DSN 475-8222 or CIV 09641-83-8222. We’re always here to help.